What will we See in ALCS Game Six? 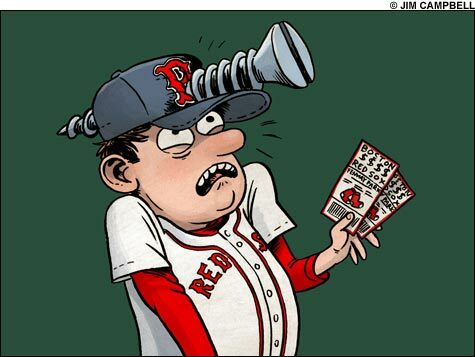 The Redsox are back to their old tricks again; coming back from huge playoff deficits. First the comeback to the Yankees after being down 0-3, and last year’s 1-3 deficit against Cleveland in the ALCS. Well, now they have brought back a 1-3 deficit to a 2-3 deficit. The only difference from last year’s comeback is that Boston was at home for games six and seven. This year they’ll be on the road in T.B. This is what the Rays earned all year. They played tough, enthusiastic baseball and earned home field advantage in the ALCS. However, if they want to avoid a game six, their pitching down the stretch is going to have to improve. Thursday night’s game was the second game of the series to feature both clubs scoring runs in bunches; game two ended 9-8 with Tampa Bay on top, and Friday’s game began 7-0 and ended 8-7. This game is going to be a close one. It’s going to come down to the pitching staff of both teams. But what will we see? A high scoring affair like in games two and five, or defensive dominance like we saw in game 1 (BOS won 2-0), game 2 (TB won 9-1), and game four (TB wins 13-4). Can the Rays knock the 'sox' off of Boston at least one game at Fenway Park? Last night’s game two between the Boston Redsox and Tampa Bay Rays was a shootout. Both teams kept trading momentum, and they did so until the end of the 9th inning, where the two teams hit a stalemate that lasted until the bottom of the eleventh inning. With the next two games being in Boston, the Rays better take what they used to attain a winning record against the Redsox in their regular season series, and try to at least come out 2-2 heading back to Tampa. This is where the Rays really have to prove their not just a feel good story, but a team that was in it to win it from the beginning of the season. But they still face an uphill battle going into Boston. The Redsox are not the team searching for a title anymore. They’re the team that now knows how to win one. The loaded rosters of both the Redsox and the Rays were shooting them out of the park like it was the Derby, and they provided a lot of entertainment last night. However, is this a sign of things to come? If so and the Rays have to match firepower, I would say that doesn’t bode well for them traveling to Boston for the next two games in the series and tied 1-1. Say it Ain’t Joe!? A Farewell to Yankee Stadium? So they said farewell last night to Yankee Stadium. Some people could care less others in my opinion care a little too much. I could go on about feeling sentimental for concrete and steel but that is not what I am here for today. Yesterday was a farewell to “The Stadium” and all that came to pass there. A chance to look back and reflect on all the wonderful moments in its history and a chance for fans to not only show their appreciation but for the Yankees organization to thank its fans as well as stick out their chest a big and blow some hot air. Where was Joe Torre? I know he is in L.A. taking the Dodgers to the post season but where was Joe Torre? There was no Joe Torre in the video montage. No one even mentioned his name. 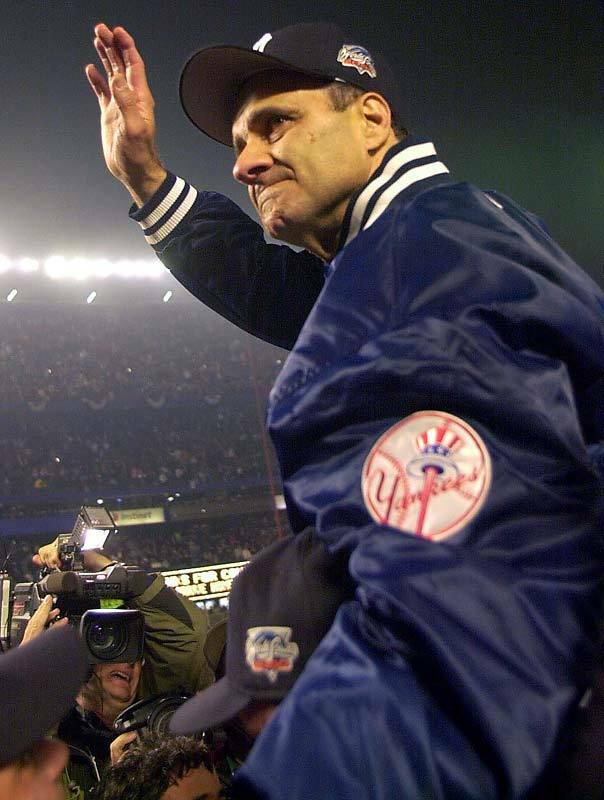 How do you say goodbye to Yankee Stadium, recognize everyone that came from start to finish including all of Joe Torre’s players who won those 4 World Championships and all the celebrated managers that came before him and NOT MENTION HIM? That is just terrible. I mean they dragged out a bunch of stiffs to represent every dead Yankee legend as well as spouses and children of deceased players. They had some of the oldest living Yankees in attendance and no Torre? Even Mattingly was missed if you blinked. That is a disgrace to me, one of Joe Torre’s biggest and toughest critics. The man gave the team everything he had. Opened his entire personal life up to the team and its fans. Ate slept and breathed NEW YORK for 12 seasons and that is how you say goodbye? 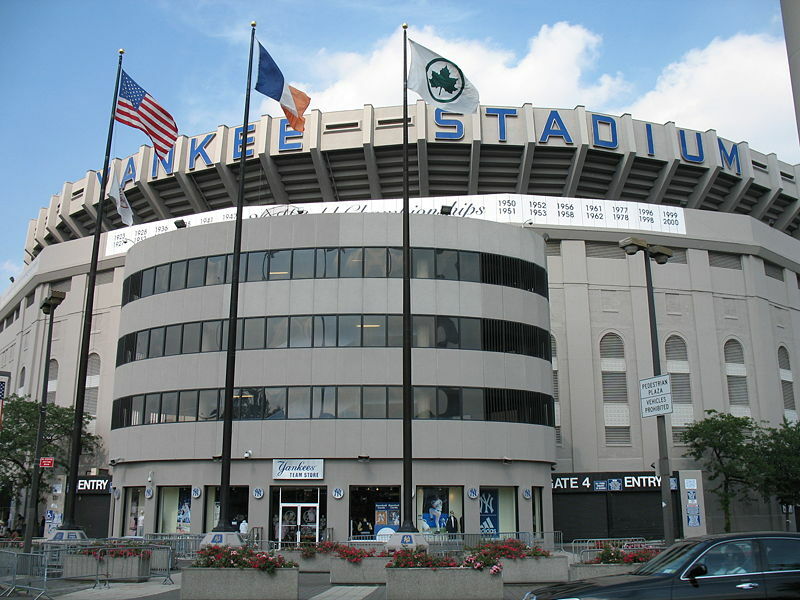 Ye 'ole Yankee Stadium. Majestic, but a Proper Farewell? 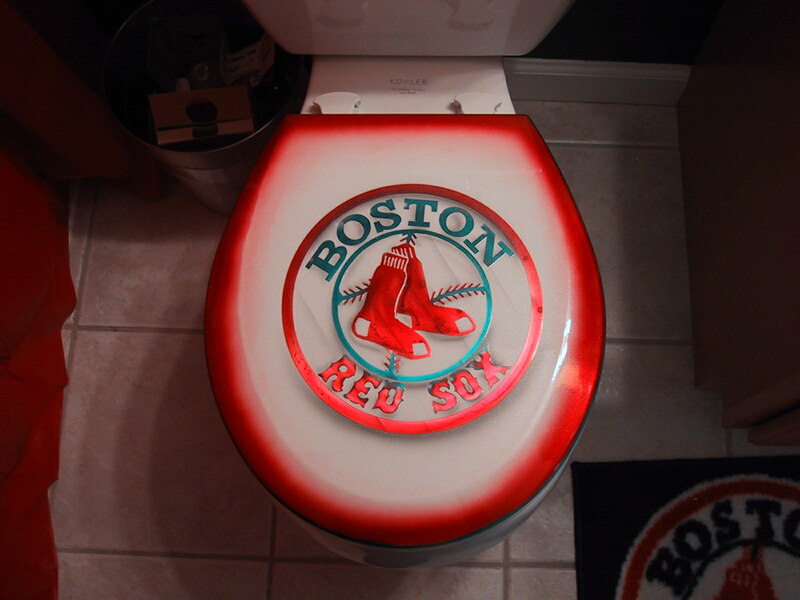 The only disgrace in Boston is Boston is itself! The organization, both ownership and front office personnel, the media and team. Especially Curt Schilling the most outspoken advocate in the world for egregious acts of wrong doing against athletes who mysteriously remained quiet during his entire tenure as a teammate yet somehow found a way to delicately trash Manny on “The Big Show with Glenn Ordway”. 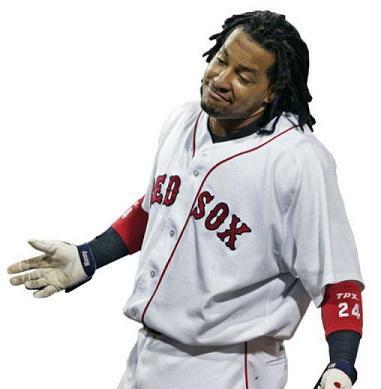 Are we to believe that they suffered for the last 8 years with Manny Ramirez? The guy was a disgrace to the uniform before they brought him in. He loafed and complained and could not play LF when he was in Cleveland, what made you think it would be any different in Boston? Now that he is hitting .400 yes FOUR HUNDRED in L.A. and single handedly carrying that team to the playoffs they want to throw him under the bus and claim somehow they are the victim here. You did it to yourselves! 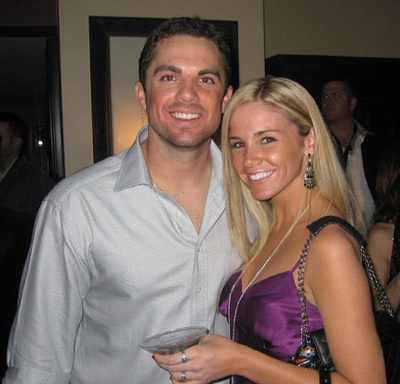 Now certainly we all know that this guy made the Red Sox. When they all embraced him and his idiocy in 2004 they made that their identity calling themselves the “idiots”. That was their mantra; HELLO? Earth to Boston. You did not create the monster, you let it out of the cage. Here we are four seasons and two World Championships later and somehow all of the sudden he’s not worth it anymore. Why? Shawn Chacon shoved Astros GM Ed Wade to the ground and was immediately suspended from the team. Let me repeat that: IMMEDIATELY SUSPENDED FROM THE TEAM! A day after his suspension the Astros put Chacon on waivers so they could release him and terminate his contract. Now who knows what really happened or why it happened. It does not matter. You shove a team official to the ground and your are out of here. Imagine going to work one day and just shoving the guy who hired you to the ground would you expect to be back the next day? A week later in Houston Manny Ramirez shoved traveling secretary Jack McCormick to the ground over an “unfortunate misunderstanding” regarding tickets. ARE YOU KIDDING ME? 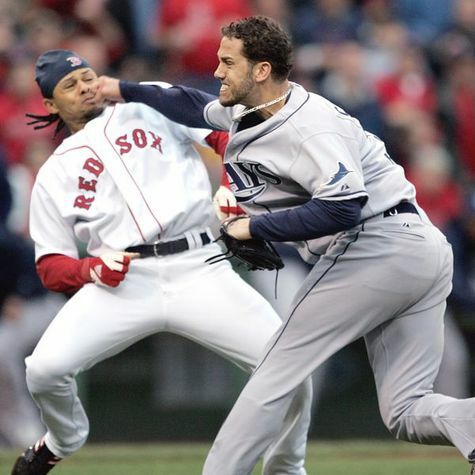 This is the same Manny Ramirez who took a swing at Kevin Youkilis in the dugout in Boston just a few weeks prior. Why was he not immediately suspended from the team and sent on his way? WHY? Why was Boston even allowed trade this guy and get something back in return for him? If this were the NFL do you think Roger Goodell would have stepped in regarding “personal conduct”? Where was Curt Schilling during all this? Oh right he was still talking about leaving Boston and going to pitch for the Yankees because he was upset with the organization too. I guess they must have kissed and made up. 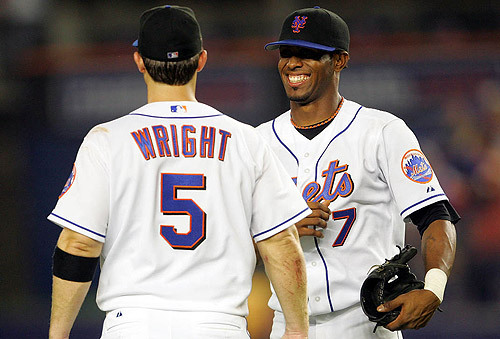 David Wright and Jose Reyes of the New York Mets. Lately, I have heard a lot of talk about breaking up the “Big 3″ or as one local sports icon calls them the “troika”. Jose Reyes, David Wright and Carlos Beltran are hardly “big” these days. However, I am not going to get on them for the Mets woes this year. The Mets lost their sub par 13 million dollar closer and have been piecing together a run at the division with nothing short of smoke and mirrors since. This team was much better than they played before Willie Randolph was fired and proved that they had quit on him since then. “Breaking up the big 3″ I must say it is an interesting proposition. Yet, this is not Milwaukee. The likelihood of that happening is close to nil if not less. There is no foreseeable fire sale ala Florida Marlins. Oh and there is no way Omar Menaya is going to ever give in to letting anyone think anything he did was not “genius”. Let’s think about this though. All the talk about “breaking them up” suggests that only one of them must go. That somehow some way all that is wrong with the NY Mets falls squarely on the shoulders of one of if not all three of these young men. Almost to suggest that they are somehow in it together, conspiring to fail. That just is not the case. David Wright goes out every night, parks his lunch pail at third base and gives you everything he has got. Then, win or lose, goes back in the clubhouse and takes it on the chin in front of the cameras and the dingo dog NY media. In the midst of all this “pressure” he quietly and without ceremony puts up MVP like numbers and delivers his share of game winning hits. Trade Wright? No way! This guy is the face of the franchise. This is the guy that Yankees fans wish they had at 3rd base most nights. Heck the Jets wish he could play QB. Bottom line this guy could get you back big dividends but its hard to replace the guy that leads the team in rbi’s every year in hopes of fixing what’s wrong with everyone and everything else. He is not going to be your three hitter or clean up hitter. Leave that to Omar’s next high priced prima donna. Any team would welcome a guy they could roll out there every single day in the 5th spot and not have to think twice about it. 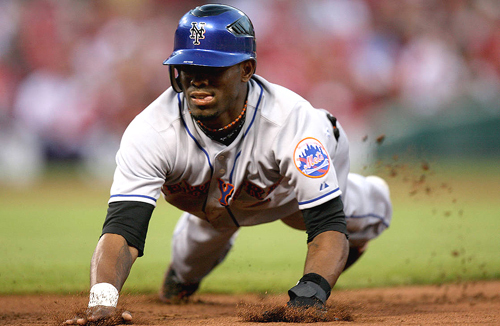 Jose Reyes. Jose Reyes. Jose Reyes. Jose Reyes goes out there every day and I just don’t know what he’s doing. People say “he’s exciting”. Why because he’s fast? Those are the same people that love to hate the Yankees and kill Derek Jeter any chance they get. The same ones who used to say “the Yankees are boring”. Well if losing is exciting I would rather be bored to death! If throwing a tantrum on the field, acting like a baby and laughing at your teammate when he makes an error in your stead are “exciting” then I surely would rather have died from boredom then to have had witnessed that from a Major Leaguer. I know what you are thinking. That I want the Mets to trade Jose Reyes. Not the case. Could they? Yes. Could they get anything back for him? Yes. In fact they could get a lot. Though I do not think this is the right move. Trading Reyes must yield a star in return. A guy that can lead off, set the table, steal bases, score runs etc. Nate Mclouth? Check out our new logo and let us know what you think.